On monday 2.11 we went to watch this movie called Dr. Strangelove: how i lerned to stop worrying and love the bomb, it was made in 1964 (USA) by Stanley Kubrick. The main actors in this movie are Peter Sellers as the president, Lionel Madrake (a officer), and as Dr.Strangelove, and Sterling Hayden as Jack Ripper. This movie is war related and it tells about Jack wanting to attack the Soviet Union due to the fact that the Soviet Union is possibly going to attack the States with a conspiracy plan. Captain Mandrake tries to recall the attack but Ripper refuses to give the 3 letter code and locks the two of them in his office. Meanwhile in the war room at The Pentagon, General Buck Turgidson tries to convince the president to eliminate the soviet threat by launching a full scale attack, so most of the soviet nukes would be destroyed before the soviets get to launch them. President Muffley refuses and calls the soviet end on a hotline, and helps them shoot down the US airplains. 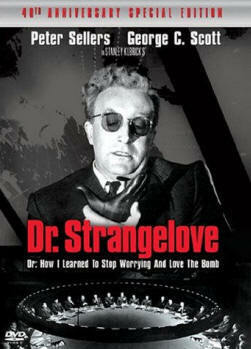 President Muffley summons Dr.Strangelove a former nazi and a strategy expert. Jack Ripper gives Mandrake the 3-letter code and shoots himself, in fear that he is gonna be tortured. As soon as Mandrake gets out he calls the president to give the code to recall the airplaines. The recall does not go to one airplain, because their radiosystem has been destroyed by an antiaircraft missle. The bomb explodes triggering a doomsday machine. The life on earths surface will be extinct in 10 months, Dr.Strangelove advices the president to put humans inside mineshafts. Suggesting a gender ratio 10 females to 1 male. The film ends in explosive nuclear explosions. I thought that the movie was acceutally quite good because of the clear plot and the funny moments. The funny moments were when the guy was flying the air plane because it was obviously fake and when the guy fell off the airplane. I dont know how this movie could be improved but maybe adding a little bit more excitment to the movie. I thought John did a good job in acting. From 1-10 I would give this movie a 7+.